It only seems logical that the Pacific Gyre (Largest Garbage Patch) would have a twin in the Atlantic Ocean, right? The swirl and splashing of ropes, diapers and plastic bins is likely to make any fish hungry for more plastic pellets. The new patch located closer to Portugal's Azore Islands is really a sore sight as well as other larger concentrations between 22 to 38 degrees North Latitude equivalent to the area between Cuba and Washington, D.C.
With no true realistic, technological means of cleaning up our one-an-only ocean, the goal by oceanographers and scientists is to raise awareness to challenge our dirty culture to switch to biodegradable products which are often more expensive for common, everyday products. 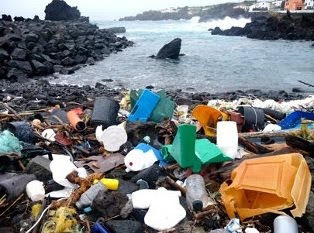 As the plastic counter continues to click, landfills and oceans also continue to overflow and overstock on with some of the most disgusting, leaky junk imaginable. To learn more about the 6,000+ plastic samples pulled for research, be sure to check out the Algalita Marine Research Foundation based in Long Beach, CA, or the National Oceanic and Atmosphere Administration.